And the signs from Saudi Arabia are not good. 60% of the kingdom’s oil comes from the Ghawar oil field that has been producing since 1951. The indications are showing that this strategically important oil field is struggling to keep up with not only our western demands but global demand too. The reports of Saudi oil wells being pumped with valuable water in that area, to help keep well pressures up, should be a significant sign that points strongly, not only to our reliance on an ageing oil field but also a waning one too. This news would never make it into the mainstream press, but this would undoubtedly be a vital indicator of the end of a 150-year-old oil dependence. After decades of frantically searching the globe for new and sizeable replacements, the search has led only to small or hard-to-reach oil fields, which won’t be enough to replace the cheap and abundant supplies we have all grown up with and used to in our daily lives. Human beings with all our technological prowess are sleepwalking or should I say, driving in our oil-fuelled vehicles into a world of even more environmentally damaging replacements, such as fracking and tar sands, to continue living in a world that no longer exists. Nuclear power is a case in point as the “too cheap to meter” promises of the 1950s have failed to deliver in addition to the Fukushima disaster, which is still to unveil its long-term effects. The same delusional promises now spouted about Shale Gas, tar sands and Arctic oil exploration, which will all turn out to be false promises and environmentally devastating too. Short-sightedness and the desperation to replace the petrodollar with alternative money-spinning fossil fuel replacement will undoubtedly transition humanity of the current oil-age to the new atmospherically damaging spoilage. Forever the optimist, I believe we already have the technology available to us, so we can begin to solve the two significant problems of peak oil, climate change and interrelated issues that were burning hydrocarbons unabated bring. Richard Branson this week said that “climate change deniers should get out of the way”, and I would extend this sentiment to the traditional energy companies whose policies are very short-sighted too. The policies of the energy companies have been proven to be short-term by the recent popularity of solar panels. A decade ago BP dabbled in manufacturing solar panels and closed down their manufacturing facilities, just as China was ramping up their world dominance in solar panel technology that we currently see today. BP and others could have been driving on the edge of the transition away from fossil fuel dependence, but chose to spend billions of dollars disputing climate and peak oil problems instead to keep energy production centralised. We have seen how putting short-term profits before long-term common sense has led us down this proverbial cul-de-sac, but these oil companies have the expertise and abilities to make a real difference in tackling these problems, now they have been finally acknowledged by even politics. The deep drilling, expertise that these companies possess could help with a new generation of geothermal power stations. As many of our current power stations now planning for decommissioning, alongside nuclear being too costly and dangerous after the Fukushima, a new direction demonstrated by the production of the new electric car industry can give us at least a fighting chance. With safer, cleaner steam powered geothermal stations to turn our all essential turbines without the insecurity and short-term-ism of the current oil and gas stations. Geothermal electric generation requires no fuel, so it is, therefore, immune to fuel cost fluctuations, which will become an increasing factor in the long-term. The heat from the planet is an inexhaustible resource, and since we already have the technology to drill down deep enough from most places on the continental shelves, this can produce the steam we need to replace gas, coal and even nuclear stations already coming offline. Why had it not done before, I hear you ask? Simply put, there is no money to be made in a fuel-less power stations. Just like BP thought there was no future in solar panels, the solutions to our problems already exist, but the requirement to keep us dependent on a centralised energy system has blinkered humanity from acknowledging that this transition is required. The last hour transition away from burning everything we can extract from the ground is possible, however, unless we take such ventures as seriously as the Chinese. We quickly realised the potential of the solar industry, then, unfortunately, we may be too late to prevent a change in the planet’s ability to produce enough food for ourselves. 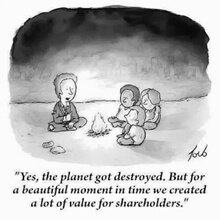 Will humanity destroy its only world because it was too shortsighted to wean itself away from burning stuff and burning any things in a desperate attempt to feed only shareholders? The temporary oil substitutes of shale and tar sands will undoubtedly need to be replaced again by the large-scale wood burning as the fundamental need to heat our homes will finally overwhelm the last vestiges of the natural world. I sometimes wonder how long it would take us to strip away the earth’s trees, woodlands and forests once they become our primary energy source after shale and tar sands have been exhausted too. We are on the cusp of a great splurge, and only a quick turnaround in public attitude and willingness to turn this great ship around can change this. This time is what I mean by the ‘spoilage’.